A hot fire: Obviously you need a heat source. 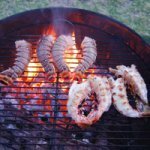 This can be a fire in a fire pit, your fireplace or a campfire. If in a pinch you can use your stovetop. 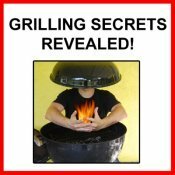 Ideally, you want the fire hot with glowing red embers. If it is a fresh fire and you get your marshmallows too close to the flames they can catch on fire to often. Skewers: Any long skewers will do. However, I prefer one with two prongs as pictured below. 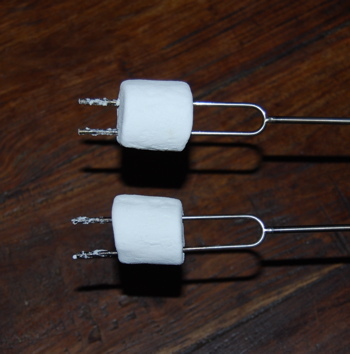 Single prong skewers tend to lead to droopy marshmallows as they cook and they can tend to fall off the skewer. Two prongs holds the marshmallows more securely. Chocolate Bars: I prefer and recommend you spend the extra couple bucks for gourmet chocolate. While simple Hershey's will do, the flavor and texture of gourmet chocolate brands is far superior! 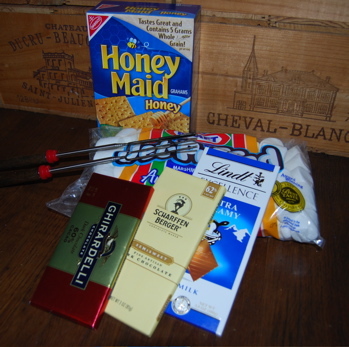 Graham Crackers: Again, any will do, but there are some more natural and gourmet brands you can find at fine supermarkets if you look. After building your hot fire, skewer one marshmallow on each skewer. Also be sure you have your Graham crackers and chocolate nearby and easily available. 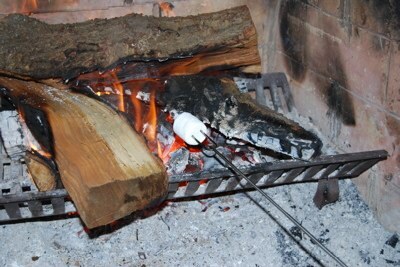 Next, simply rotate the marshmallow near your fire. Be sure to keep rotating to cook evenly. Also, try not to get too close to the fire so that they don't catch fire and get charred. If they do catch fire, quickly blow them out. If you don't like the black, char, simply pull it off before eating. I prefer a nice brown, toasty marshmallow. Take your time and rotate them near, but not in the fire. It can take a while but it is worth it! When your marshmallow is done to your liking, lay it on a piece of Graham cracker and use a piece of chocolate to pull it off the skewer. 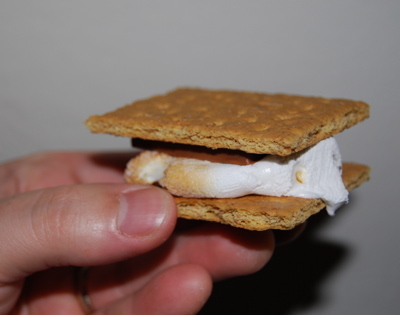 You can now either eat the smore or add another layer of Graham cracker to make a full sandwich as seen above. Some people prefer to melt the chocolate somewhat when learning how to make smores. 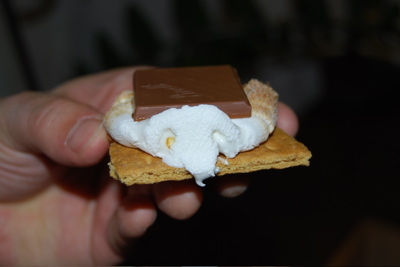 It will melt a bit just with contact with the hot marshmallow, but if you really want it gooey, you can warm it first in the oven prior to assembling your smores. 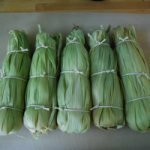 Another option is to place the whole thing, wrapped in foil, into a warm oven for a few minutes. Have fun learning how to make smores! Enjoy! Done learning how to make smores? 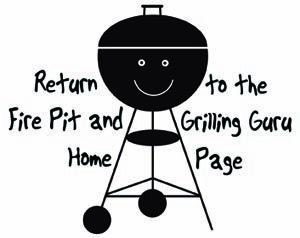 Return to the Fireplace Cooking page.